Jay Z is known for many things: talented rapper, husband of the beautiful and equally talented Beyoncé Knowles, clothing designer, record label guru, Rolex watch fan, and good citizen. Today, September 11, 2009, in remembrance of the tragedy that struck our nation eight years ago, Jay Z is giving a charity concert, called “Answer the Call” at New York’s Madison Square Garden. Tickets are going for $50 and Jay Z has said that he will donate all proceeds to the New York Police and Fire Widows’ and Children’s Benefit Fund. The concert is expected to raise between $750,000 and $1 million dollars. On a personal level, today is also an important day for the rapper as he is set to release his 11th album, this one titled “The Blueprint 3.” Ironically, it was eight years ago today that Jay Z released his first “Blueprint” CD, when he nor anyone else would have any idea how tragic that day would turn out to be. And that about sums it up. 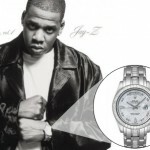 With a fortune estimated at who knows how much, a hundred million dollars maybe, Jay Z can afford to wear any watch of his liking. Like most celebrities, he chooses Rolex. The Rolex Day Date was never made in stainless steel. It has only been produced in gold (white yellow and rose) or platinum. whoever wrote this article and said he is wearing a master piece is a moron who prob lives in the middle of nowhere! it is a yellow gold day date prezzy!! !